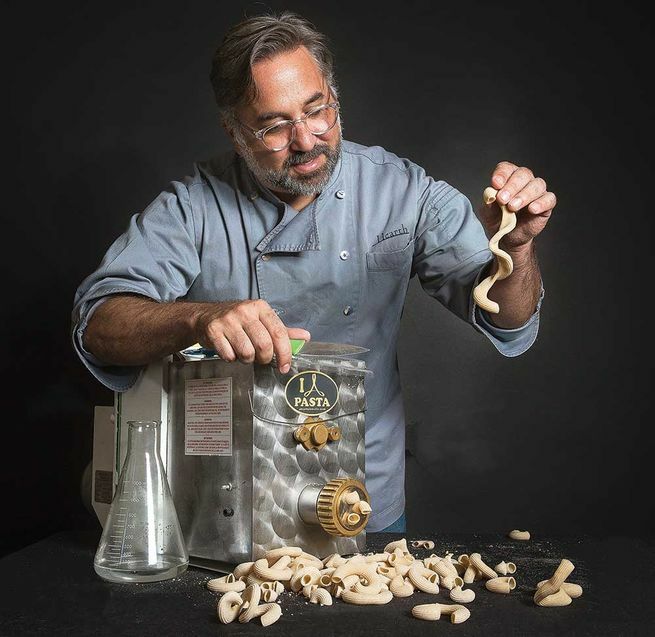 The health-conscious chef of Hearth in New York is milling his own flour for superior nutrition—and flavor. After 10 years of running the Tuscan-inspired East Village restaurant, Canora had become the poster child for chef burnout—late nights, weight gain, open-kitchen shouting matches, gout. Knowing he needed to make a change, he reinvented himself as the world’s unlikeliest wellness guru. First came Brodo, a window hawking restora­tive cups of broth to people who would otherwise grab a cold-pressed juice. Next was last year’s reinvention of Hearth as a lighter, healthier restaurant. The new menu has an 11-point illustrated manifesto on the back outlining his new mission: Vegetables and butter are good; chemically extracted oils and antibiotic-laced meat are verboten. At the bottom is a promise: All grains will be milled in-house. The health reasons span from the obvious (everyone knows whole grains are better for you, right?) to the more esoteric (freshness counteracts the menace of oxidized fats).